Give baby lots of bear hugs This fabulous nine piece baby gift set features a cushiony soft quilted bear play & changing mat that's made in the USA by Silly Phillie � and sized at 32" x 18" to provide comfort & support during diaper changes and floor play time. 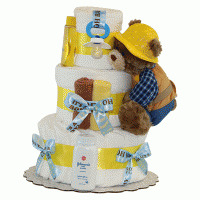 The adorable bear character design has plush fabric accents to provide a stimulating tactile sensation for baby. Beautiful baby boy blanket An incredibly soft and plush baby blanket is also included. White with blue dots, this two ply micro fleece blanket measures 30" x 40", is machine washable, and is remarkably warm yet light to the touch. Both baby and parents will love it! Coordinated layette items There's alot more to this gift. Seven other essential layette items are included. All but the soft moon toy wrist rattle are made in the USA by Silly Phillie�. Four of them, including a terry hooded towel, come embellished with the sweetest bear embroidery to give this gift it's coordinated look. The complete list of components: Quilted bear character play & changing mat Soft & plush two-ply baby blanket Terry hooded towel w/bear embroidery Terry bib w/bear embroidery Terry washcloth w/bear embroidery Cotton interlock hat w/bear embroidery 2-terry burp pads Moon toy Make a big impression Size and presentation definitely matter when it comes to gift giving. And this gift delivers on each beautifully. Impressively large at 24" x 6" x 10", and tastefully presented as shown in the main photo, you can be sure your gift will be immediately noticed and appreciated, even when surrounded by other gifts! 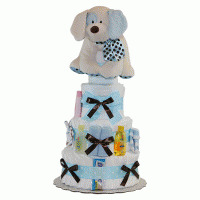 Clear cello wrapping & ribbon are added to enhance the beauty and wow factor of this unique baby gift. 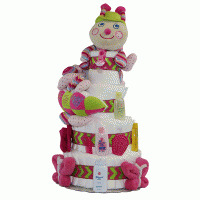 Need one of these delightful gifts for a baby girl? See the image above and click "here" to order.